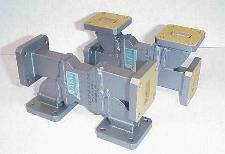 ATM manufactures Waveguide Short Slot Hybrid Combiners/Dividers in a choice of configurations. Useful in applications where smaller sizes are required. For applications where full band width is needed. For uneven power distribution of values other than 3dB, ATM manufactures Broadwall Coupler Combiners/Dividers which utilize a multi-hole coupler design resulting in full band width. Note 1: If F1 is input, then F3 and F4 are 3dB nominal and F2 is isolated from F1. Note 2: The 'A' & 'B' dimensions for Styles W & X Combiners/Dividers may change based on flange type selected. 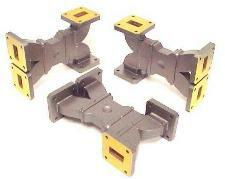 See ATM Flange page for more information on flanges.